A few of our Missionary Kids creating their very own “mobile homes”. Recently I had the opportunity to take care of a few of our missionary kids while the parents attended a meeting. As I played with them, they began to explain what they were doing -building their very own mobile homes. 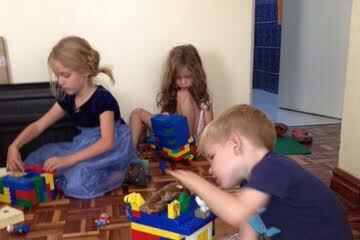 Each of the children (from two different families) had taken off with the idea and were busy at work. The significance was not lost on me as I watched how carefully they filled their portable houses with treasure. After all, no one knows better than these little “refugees” what it means to leave one’s toys, blankets, homeschooling books, clothing -well, pretty much everything – behind. No wonder each house had wheels! The saddest part for me was watching them try to fit in the people. Leaving things behind is difficult enough, but these MKs have also left behind close playmates and friends. It is a picture in miniature of how the grown-ups on our team are also grieving. Only they don’t have the option of play-therapy. Later this week, our team will come together for the annual Spiritual Life Conference from January 22nd to 26th. Several months ago, we made the very fortuitous decision to move the SLC to January -not knowing how significant that move would be. It is a time for all of us to come together and be refreshed spiritually and physically at a beautiful retreat center here in Kenya. The first part of the day will be spent in worship, prayer, and hearing God’s Word. The latter half will be rest, fun, and fellowship. There are children’s activities planned throughout the day as well. It will be a time for all of us to reflect on God’s call in our lives and what that means during these days of uncertainty. We can rest and pray and look a little deeper than we usually have time or energy to look. It could be that come away with a new appreciation of His work in us and through us -being mutually encouraged and renewed. To that end, we would like to ask you to please pray for us and our team during this Conference. As the situation in South Sudan deteriorates, there are difficult decisions to be made about moving forward and how to proceed. We need God’s wisdom and peace. Pray for our teammates as they have been out of S Sudan for almost a month now and many are weary of being “in transition”. This is especially difficult for families with children. Pray for peace in South Sudan. We heard from news reports recently that as many as 10,000 people have been killed in the fighting. Many have fled to churches seeking shelter. Pray that the believers in South Sudan will extend mercy and grace to those of any tribe and model the all-encompassing love of Christ. we don’t write often but we do read and pray…. Praying now for these “mobile ones” and for all of you as you go into your much-needed retreat. Thanks for that great summary, Mark and Stacey. You are doing a wonderful job encouraging the folks on the SIM Sudan team by your love, and generosity with your time and resources. Thank you for all you are doing for that wonderful team, especially at this challenging crossroads for South Sudan.